I would like to write some strategy guiding contents about how to beat a Hamster when it gives you some handicap. 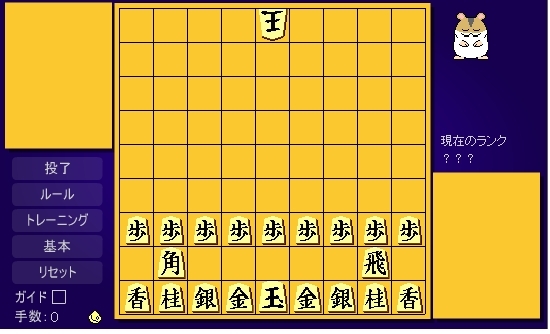 Hamster means the character of Hamshogi. You can read the instruction in English how to use it here. In order to fight with Hamster in Naked King Condition, please click the left red button in the bottom on the board. The example can be found above(The colour of the button changed on clicking). Then you can have the starting setup as below. Move only Pawn, Rook, and Bishop. Make minimum Pawn moves so that the most powerful Bishop and Rook can move more easily. Open Bishop's diagonal line and let Bishop get promoted first. Then advancing Rook's pawn twice and let Rook float just behind the Pawn. Slide the Rook horizontally to intent to get promoted. After both Bishop and Rook promotion, Keep their connection and approach Hamster's King. After Bishop and Rook promotion, you do not have to use Pawn while it was nesessary before their promotion. On diagram above, Hamster made his first move like K-4b. What should you move? See the seven direction above. You should open your Bishop's diagonal line like P-7f. You can replay the game by clicking the arows under the board with reading these sentences for better understanding. At the 3rd move, Hamster moved his King to 3b. What's your next move? Yes, you can let your Bishop get promoted without being captured. You should move your Bishop to 1a with promotion like B-1a+. Please take care. If you move your Bishop to 2b or 3c with promotion, your promoted bishop will be captured by Hamster's King immediately by Kx2b or Kx3c. After your Bishop promotion, Hamster moved his King to 4a as the 5th move. What's your next move? I recommend you to pulling back the promoted Bishop to 4d. Now you find your promoted bishop can move toward four long diagonal directions from 4d while it could go toward only one long diagonal direction from 1a. Which means Promoted bishop on 4d works better than on 1a. In general, promoted bishop on one of the central 9 squares often works better than on a square of other area on the board. Now, you placed your promoted Bishop on a good square. What's next is to make your Rook become able to work well. 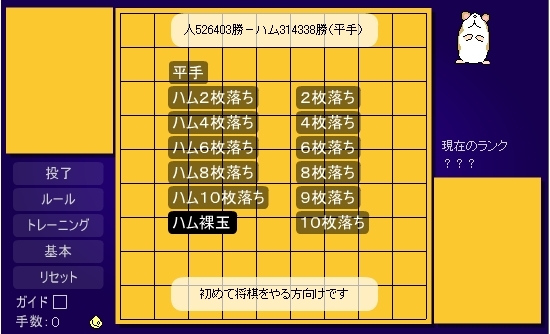 Please advance your Rook Pawn twice such as P-2f and P-2e using your next two turns. Then you should let your Rook float bihind the moved Pawn like R-2f. Now your Rook can slide to the 1st through 6th file. After that, please move your Rook on 3f and then let it get promoted by R-3c+. Now, your Bishop and Rook must already got promoted. These two powerful pieces will be enough to mate Hamster's King. Please take care so that they can supports each other without isolation. Move both pieces to approach Hamster's King. Good luck!! Here is another example between Hamster and myself to replay. I will come back to this series in the near future. Next one is about 10 piece handicap.